This book can best be described as charming, fun to read, and even a bit enlightening! Told through the perceptive of one very lucky cat, we get a glimpse on what it might be like to live inside the home of the Dali Lama. ‘Oh! How adorable! I didn’t know you had a cat!’ she exclaimed. I am always surprised how many people make this observation. Why should His Holiness not have a cat? ‘If only she could speak,’ continued the actress. ‘I’m sure she’d have such wisdom to share.’ And so the seed was planted . . .
A fun and easy read, it will draw you in with it’s warmth and humor. I loved the lessons that each chapter taught, subtly yes, but there none the less. From her rescue story to her meetings with dignitaries, this little kitty know how to tell a tale! I found myself wishing it were all true, as I was falling more in love with this sweet cat. Within her story are many founding principles of Buddhism, told in such a way that anyone could easily relate to them. It’s the type of story where you can glean wisdom and be entertained at the same time. It is also a story I am sure to enjoy reading again. 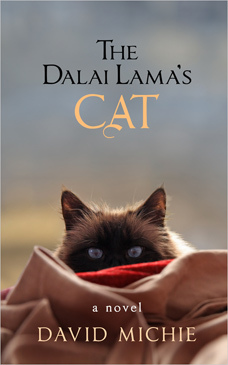 Find The Dalai Lama’s Cat on Amazon or anywhere fine books are sold. Thank you to Hay House for providing me with a copy free in exchange for my reviewing it.